The regulations and requirements for these accessible charging stations are very specific, and the article below, written by my partner Marty Orlick, gives only a high-level summary of the scoping and technical requirements. This is an area where you really need to talk to the experts. Are Your electric vehicle charging stations “accessible” to disabled guests under California’s latest regulations? With the surge in popularity of electric and hybrid vehicles, the need to provide Electric Vehicle Charging Stations (EVCS) is on the rise at hotels, theaters, stadiums, and hotel mixed-use properties. If your EVCS are not accessible to your disabled guests, here is what you need to know. In California, if your commercial facility provides EVCS for your customers and guests, you must also provide a certain number of EVCS that are accessible. California’s accessibility regulations for EVCS are in the 2016 California Building Code (CBC), and went into effect on January 1, 2017. The regulations supersede and expand upon California’s little-known “Interim Disabled Access Guidelines for Electric Vehicle Charging Stations” created in 1997. The CBC accessibility regulations include both scoping requirements (what type of EVCS and how many) and technical requirements (where to locate EVCS, and how to make them accessible). The number and type of accessible EVCS required is determined by the total number of EVCS at a facility. When new EVCS are added to a site with existing EVCS, the total number of new and existing EVCS is used to determine the number of accessible EVCS. The table below, provided by the California Division of the State Architect, sets forth these scoping requirements. Technical requirements apply only to new and altered EVCS; existing EVCS do not have to be altered to meet the new technical requirements. 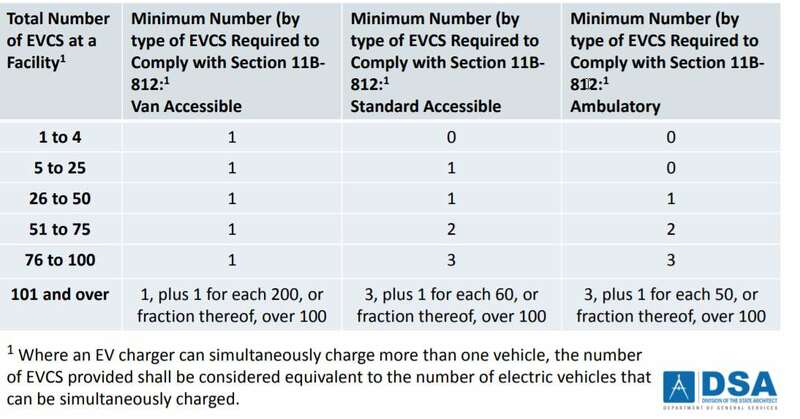 The table above includes the minimum number of EVCS for three of the four types of accessible EVCS under the CBC’s accessibility regulations: van accessible, standard accessible, and ambulatory. Each type of charging station has specific technical requirements, which are outlined in CBC 11B-812. The fourth type, “drive up,” is analogous to a motor fuel pump island at a gas station, and is also included in CBC 11B-812. The technical requirements include accessible aisles, accessible routes, and electric vehicle charger requirements. Technical provisions include specific requirements for signage. EV charging time limits can be applied to all users, including disabled users. Vehicles displaying accessible placards or license plates cannot park for unlimited periods of time at accessible EVCS, if the signage is in accordance with local ordinances. Although there are no federal standards for EVCS accessibility, provisions are being proposed. However, consistent with general guidance provided by the U.S. Access Board, if your facility provides EVCS for use by the general public then it must also be accessible to individuals with disabilities. If you intend to (or are requested to) install electric vehicle charging stations at your property, you need to consider whether they are accessible to persons with disabilities. Since the proposed scoping and technical requirements are highly technical and complex, you should consult the experts before you design or install electric vehicle charging stations. Martin H. Orlick is one of the top ADA defense lawyers in the country. He has helped hotel, restaurant, retail and other commercial property owners defend more than 600 ADA cases. In addition to defending lawsuits and governmental investigations, Marty’s team of ADA specialists focuses on enterprise-wide ADA compliance and litigation prevention, including facilities, website and operational compliance. He is also is a senior member of the law firm’s Global Hospitality Group®, a partner in the real estate department, and a member of the American College of Real Estate Lawyers (ACREL). For more information about ADA compliance and defense. Contact Marty Orlick at 415.984.9667 or morlick@jmbm.com.